Looking for a mortgage? Sean Cooper is my go-to mortgage expert. Not only did he pay off his own mortgage by age 30, he’s the best selling author of Burn Your Mortgage, and he’s also a mortgage broker. 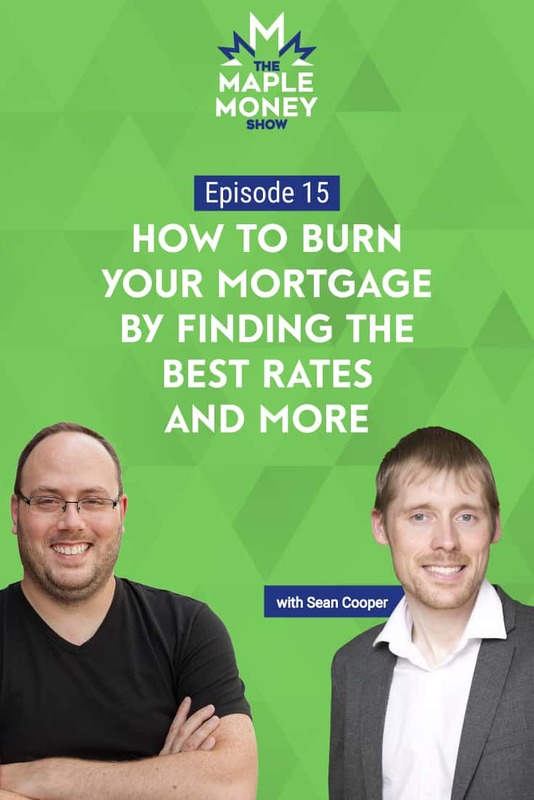 In this episode, Sean gives you a checklist of everything you need to know when shopping for a mortgage, whether you’re buying your first home, or your current mortgage is up for renewal. Sean explains why getting pre-approved for a mortgage is usually the first place to start when buying a home. Not only will it help you establish the right price point, but realtors prefer to deal with qualified borrowers. He also explains how a shorter amortization will save you thousands of dollars in interest over the life of your mortgage, but cautions against choosing an amortization that is too short. Our sponsor this week is Borrowell. Not only does Borrowell provide you with a credit score, they now give you free credit reports as well. A credit report can be more valuable than a credit score, as it allows you to identify any incorrect information that might be on there before you apply for your first mortgage or car loan. Head over to Borrowell to get your free credit score, and more. How Sean paid his mortgage off by age 30. Your first step to getting a mortgage. Why you should always include a ‘condition of financing’ on your offer to purchase. The role your credit score plays in obtaining a lower mortgage rate. Why it’s a good idea to pull your credit score well in advance of applying for a mortgage. What is mortgage default insurance, and how can it help? Discover the two main ratios that lenders look at when approving your mortgage. Sean explains the benefits of the Home Buyers Plan. How a shorter mortgage amortization can save you thousands over the long run. Looking for a mortgage? Sean Cooper takes us through a checklist of everything you need to know when shopping for a mortgage whether it’s your first or you’re up for renewal and want to find the right mortgage for you. Sean is my go-to mortgage expert. He paid off his mortgage at 30 years old. Now he’s a bestselling author of Burn Your Mortgage and he’s also a mortgage broker. Welcome to the Maple Money Show, the podcast that helps Canadians improve their personal finances to create lasting financial freedom. Tom: Hi Sean. Welcome to the Maple Money Show. Sean: Hi Tom. How are you doing? Tom: Good, how are you? Sean: Pretty good, thank you. Tom: I’m glad to have you on. You’re sort of my mortgage expert. You paid your mortgage off 31 was it? Sean: Actually, I set a goal of paying it off at 31 but I actually managed to do it by 30. Tom: Let’s give the listeners here some mortgage tips. Starting right at the beginning, if someone’s looking into buying a house maybe it’s the first house or maybe they’re looking for a new house, what’s that first step? Should they get pre-approval? Is that even a real thing? Because I thought I heard there was a catch in that you’re still not totally approved. Sean: Getting pre-approved for a mortgage is definitely helpful because a lot of real estate agents won’t even work with you unless you’re pre-approved because they want to know how much you can actually go out and spend on a property so being pre-approved for a mortgage is a good first step. There’s also being pre-qualified. If you’re actually serious about buying a property I would encourage you to be pre-approved because being pre-qualified is just basically entering some basic information on a lender’s website and then they kind of spit out a number. Being pre-approved is kind of the next step if you’re serious about buying property. When you’re pre-approved for a mortgage then you have that all important number in terms of how much of a mortgage you can afford under the current mortgage rules. That includes your income and down payment. You basically have a number to work with. Depending on what your income and your down payment is and if you’re buying with a partner or whatnot… Let’s say you go out and spend $500,000 on a property. Of course, that would depend on what market you’re buying in. But at least you can kind of hone in on certain property types. So, if I’m buying in a market like Winnipeg then I could perhaps afford a detached house. But if I am trying to buy in a market like Toronto $500,000 is definitely not going to cut it. So it kind of helps you hone in on those choices and use your time and the real estate agent’s time in a good way. Now, you were mentioning about a pre-approval. I’ve heard people say that a pre-approval isn’t worth the paper that it’s written on. And I agree with that to a certain degree. Pre-approval is definitely helpful but it’s important to take note that the lender only knows part of the story. They know your income, your down payment, and your credit information but the missing part of that story is the actual property. They don’t actually know the property that you have bought yet. You could buy a property that the lender doesn’t like. There could be any number of reasons why they don’t like it. It could be because of the location of the condo unit you’re buying. It could be in a location that the lender doesn’t like. It can also even be because of your neighbor’s property. I’ve actually heard of lenders refusing properties because they don’t like a neighbor’s property nearby. So the missing piece of the puzzle is the property. To protect yourself, I would encourage you to make your offers conditional on financing because you never know what reason the lender could perhaps refuse to lend to you. And, if you don’t have any conditions at all then you can lose your deposit and get sued. It’s certainly not a good position to be in. The lesson of this story is to do conditional financing. If you’re a multiple offer situation, I understand that you’re under pressure but I don’t think it’s worth being sued by the seller of the property. Just weigh that or consider getting perhaps another property instead. Yeah, it definitely is important to get that condition to protect yourself, Tom. Tom: That’s a good point. The thing I was thinking there too was to get approved for more, not that you necessarily just want to get approved for as much as possible but I would think that getting a good rate would be helpful. You mentioned credit scores. How much does that come into play? Sean: Your credit score is definitely important. For example, lenders have different credit score cut-off levels. Generally, they want a credit score over 680, so if you have a lower credit score then you might not be able to get the best mortgage rate. Of course, that will cost you more mortgage interest over the long-term. And, if your credit score is so (even below the 600s) then you probably can’t qualify with an A-lender, prime Lender or the best lenders out there. You might have to go with an alternative solution or even a private lender. And that will cost you a lot more in the long run. With a private lender or alternative lender you could end up spending double digits in interest. Your interest rate could be over 10 percent and you might have to pay a lender fee as well. Generally, when you’re working with a mortgage broker you don’t have to pay a mortgage broker any fees. But, if you’re working with an alternate lender or a private lender then you might have to pay a fee to the broker and the lender themselves. It’s best to avoid that situation if possible and basically be responsible with your credit. Anything you buy on your credit card, just make sure you can afford to pay it off in full and on time. Basically, treat it like cash. I could go on for hours about this but basically use credit responsibly. You don’t have to know all the ins-and-outs of how your credit score is calculated but just try not to use too much of your credit utilization. Otherwise, you can get in some hot water and damage your credit score. Of course, you can get your credit score for free online through various websites. So just keep an eye on that. I recommend pulling your credit score at least six months in advance of when you’re thinking about buying property. That way if it’s lower than you anticipated you can take steps to make your credit score better. Then you can get a mortgage with an A-lender and not have to deal with a private lender or an alternative lender. Tom: Those are good tips too. Even in general, if you’re putting money on a credit card and not paying it off, it’s not just hurting your credit score but you’re wasting all that money in interest. There’s no winning at all with that. You mentioned fees, and another fee that comes to mind is the CMHC fees. I’ve always made sure that I put the 20 percent down at least just because I don’t want to pay the extra fees. I’m not even sure off the top of my head what those fees are right now, but can you give us a little info on those? Sean: Sure, definitely. As you mentioned, if you put less than 20 percent down on a property, you’ll be required to pay mortgage default insurance. Now, people hear “mortgage default insurance” and think they’re protecting themselves but that insurance is actually to protect the lender if you fail to repay your mortgage and run into financial difficulties later on. People kind of think mortgage default insurance is a cash grab and is no good. The thing is, without mortgage default insurance the mortgage rate (if you’re putting down less than 20 percent) would probably be a lot higher. And the lenders might not even allow less than 20 percent of a down payment. I don’t know about you but if you had to save up 20 percent down payment at least to buy property in Toronto, good luck with buying a house if it’s for a million dollars. I mean, that would be pretty difficult. So mortgage default insurance is good because it helps you get a lower interest rate. Something I found out (being a mortgage broker) is the advantage with mortgage default insurance is you typically get a better mortgage rate when you put down less than 20 percent as opposed to if you put down, let’s say, 25 percent. It’s because the lender is protected by this mortgage default insurance. If you put down more than 20 percent and your mortgage is insurable, basically, your lenders paying the default insurance. You’re not paying it yourself. But yeah, generally the sweet spot, if you’re putting down more than 20 percent, is a 65 percent loan devalue. That means a 35 percent down payment. If you had at least a 35 percent down payment then typically your mortgage rate is the same for somebody that’s putting down less than 20 percent. With mortgage default insurance you generally have the choice of either adding it to your mortgage and having it amortized over the life your mortgage or you can pay it off all at once when you’re moving into your house. But, I don’t really know anyone who can afford to do that unless they’ve won the lottery. But that’s a good way to get into the market if you’re buying in an expensive housing market. If you’re buying in a more affordable market, like Winnipeg, then try to aim for that 20 percent and avoid it altogether because it certainly can add up to a lot of additional costs over the life of your mortgage. Tom: It sort of seemed that sometimes the rates were less than 20 percent and I was thinking maybe that kind of offsets that a bit, right? Sean: Yeah, the fee does help with that. And lenders might not even be comfortable offering as little as 5 percent down. It definitely opens up the housing market to people that I like to call “marginal buyers” who are buying on a shoestring of 5 percent. Certainly, I think it’s good because good luck coming up with a 20 percent down payment in Toronto or Vancouver. You’d be saving for years. If you look at average income levels it would probably take you over 10 years to save up a down payment so I’m certainly glad that mortgage default insurance does exist because it does let people in the housing market that couldn’t get in normally. Tom: Yeah, and like any insurance it’s really all about the stats with risk. If the bank perceives you as a higher risk because you have 5 percent down then the insurer, threw you, has to reduce that risk. Tom: The only other thing I could think of when it comes to the ability to get a mortgage is the other debt you have and your household expenses. There’s different ratios for that? Sean: Yes, that’s correct. There are two main ratios that lenders look at in terms of your debt. They look at the GDS (gross debt servicing) ratio and the TDS (total debt servicing) ratio. The GDS ratio basically looks like your income versus the principal, interest, taxes, and heating’s. So the acronym for that is PITH for those four expenses. They basically look at your gross annual income versus that. Lenders are generally looking for a ratio of 39 percent on the GDS. Now, on the GSI it’s the exact same thing. Your gross income versus your principal, interest, taxes, and heating. And I forgot to mention the 50 percent condo fee if you have a condo there. But it also looks at any other debt you might have. For example, if you have a student loan, line of credit, car payments, those are added into it as well because it definitely hampers your ability to pay a mortgage if you have other monthly debt obligations. So it takes factors them in. And generally, lenders are looking for a TDS ratio of 44 percent and under now. That’s just a general guideline. There might be some exceptions but just with the government clamping down on the mortgage industry nowadays; a lot of lenders are a lot less flexible with those. So certainly, if you have 39 and 44 percent TDS and GDS respectively, then that’s good. It’s also a way to protect yourself as well because you don’t want to overstretch yourself in terms of your finances and buy too much house because if interest rates go up and your mortgage renews then your payments could be higher. I think that’s a good way to protect yourself and avoid being stretched on cash. I don’t know about you but I certainly don’t want all my money to go towards my mortgage and never be able to afford to take a vacation or have any fun. I certainly would think that my spouse (if I had one) wouldn’t be very happy if I did that. I think it’s good to stay within those guidelines with the TDS and GDS ratios. Tom: If those are relatively hard ratios, does that mean it is probably more important to pay off your debt than have additional down payment? Let’s say I had $10,000 extra just before I was about to buy a house. Would it be better to pay off some debt if it helps improve those ratios? Sean: In personal finance, and I don’t mean for this to be a copout but it definitely depends on the scenario. That’s why it’s so important to speak with a mortgage broker to help them run the numbers because they can take a look at what the numbers would look like if you were to pay off that debt before you get the mortgage or if you were to put that debt towards the down payment. So it really depends on the purchase price of the property that you’re trying to hone in on as well as your down payment amount and income amount. Definitely run the numbers with a mortgage broker because they can help you come up with a good game plan if you’re not in a place where you want to be in terms of the purchase price. So yeah, it really depends on your own personal situation. Tom: Okay. One of the best ways for me when I had my first down payment was I used the Homebuyers Plan. A lot of people might not know about that. Could you go into that a bit? Sean: Sure. Under the Homebuyers Plan you’re able to withdraw up to $25,000 from your RRSP tax free. If you’re buying with a spouse that’s a combined $50,000 that you’re able to withdraw. While it’s a great program you just have to make sure you follow the rules. Any money that’s withdrawn has to be repaid in equal installments in a 15-year time period starting in the second year. If you fail to do that, not only will you lose the RRSP room for ever it will be included as taxable income. So make sure you follow the rules. And, when you’re initially taking out the money, make sure you speak with your lender because if you just take the money out of your RRSP without actually filling in the correct tax forms then it’s going to be considered a regular withdrawal and you’ll lose the room forever and you’ll face hefty withholding taxes. So make sure that you do that. Some people might think it’s a bit of a no-brainer that you need to fill in these tax forms but you’d be surprised about some of that stories I’ve heard where people actually take the money out and think they can go back to the lender and just tell them it was for the First Time Homebuyers Plan. You get into murky waters here. Some lenders might be okay with correcting me after the fact, but I’ve certainly heard of other lenders who weren’t okay with that. And with the government clamping down on the mortgage industry and regulators keeping a close eye on the financial institutions, they’re not really as lenient as they used to be. So you should make sure you follow all the rules the Home Buyers Plan and you should be fine. But I definitely think it’s a great way to get into the market because you can save that money and then withdraw it without paying any taxes and you can basically reach your down payment goal a lot sooner. It’s certainly worth exploring if you’re a first time homebuyer. Tom: Speaking of mistakes with the Homebuyers Plan, I’ve got to admit. I did find when I filled out the form with the bank and everything, the very first year that it was due I forgot to claim on my taxes that 1/15 or whatever it was to go to the Homebuyers Plan so I ended up paying income tax on that fraction because it was just considered extra income that year. When you don’t claim it, it’s like you just pulled it out normally. It was a small amount just for the one year. But yeah you certainly have to make sure you’re following everything. Sean: Exactly. Just make sure you dot all your i’s and cross all your t’s. But, it’s a great program. Just make sure you understand the basic rules of it, follow them and you should be fine. Tom: How about years of amortization? Off the top of my head I’m not even sure… is it 25 years that’s the maximum now? It’s changed a couple times since I first got my mortgage. Sean: Yes, so back in the day before the financial crisis happened in 2008 you could get up to a 40-year amortization. That was pretty crazy in my opinion. Imagine having a mortgage for 40 years. You would definitely be paying a lot of interest that’s for sure. It’s basically the maximum for an insured or insurable mortgage which basically means that the mortgage insurers (like CMHC Genworth) will cover this 25-year amortization. But with some lenders if you’re putting more than 20 percent down you can get a 30-year amortization. That still exists. And I think you may even be able to get more than that. You just have to remember a lower amortization means the length of time it takes you to pay off your entire mortgage. So the advantage of a longer amortization is that you’ll have lower mortgage payments. That will help you in terms of cash flow but what doesn’t help you is that the interest is compounding even faster. Even stretching your amortization out by five years can cost you a lot of money in interest. So I’d certainly run the numbers. A 30-year amortization is an option and it’s actually what I did myself. But I did it in terms of cash flow flexibility, and then what I did was I took advantage of all those prepayments. I doubled up my payment and made a lump sum payment and increased my regular payment. That way I was able to pay off my mortgage in only three years with a 30-year amortization. So if you’re somebody that’s financially disciplined and you’re motivated to earn your mortgage similarly, then a 30-year amortization can be worth looking into in terms of the flexibility of cash flow. If you’re somebody that is only going to pay the minimum payment and you’re not as financially disciplined then perhaps it’s better to go with a 25-year amortization because lenders typically charge you a premium to go with the 30-year amortization. You might have to pay a mortgage rate that’s .05 percent higher or one percent higher. I would say, typically, go with a 25-year amortization unless you’re super financially disciplined and you’re a single income household just worried about cash flow if you ever lost your job then a 30-year amortization might be worth it. But I’d say a 25-year amortization is worth it. And, if you make those extreme payments then your amortization’s going to be cut. And when you renew your mortgage it won’t necessarily be 20 years. It could be less than that. But that’s just your starting point. The 25 years is generally the maximum for an insured or insurable mortgage. Tom: I like the idea of doing less years if you can because a lot of people aren’t able to make those prepayments just mentally. They don’t put their money there but if they go smaller amortization it’s sort of forced savings. Not only are you not paying that extra interest, you’re putting more money away quicker than having to. Sean: I just have a word of caution. I’ve heard where people can get a 25-year amortization but they want to pay down their mortgage even faster and go with a 15-year amortization. I’m not sure that makes the most sense because if you were to lose your job, you’d be stuck with those really high mortgage payments. I don’t know about you, but when you lose 100 percent of your income it can be very difficult so I’d rather have the flexibility of a 25-year amortization with the ability to double up and make pre-payments and lump sum payments. That way, if you want it paid off sooner, you can. And you’re not really forced to pay the higher payments. That’s my own personal preference. Tom: That’s a good reason to have a mortgage broker too because you’ll make sure you’re getting a mortgage that allows you to do all that. I know there are different rules. Like, some allow more to be paid off in a year than others, right? Sean: Exactly. The pre-payments vary between different lenders. Some people just assume that it’s the same with all lenders but that’s definitely not the case. So the pre-payment privileges and amounts can vary between lenders. For example, one lender may allow you to make a 10 percent lump sum payment in a given year while other lenders might allow you to make 15 percent or 20 percent. So, if you want to aggressively pay down your mortgage and the rate is the same you might want to go with the lender that offers the 20 percent. And on the topic of lump sum payments, some lenders only let you make that lump sum payment once a year on the anniversary date. Other ones actually let you make it throughout the year. As long as it totals up to 15 or 20 percent or whatever the limit is then they’re okay with that. So you definitely want to read the fine print. That’s why it so important to work with a broker because they can assess your needs. They’re basically a mortgage matchmaker. They can match you with the lender that has the best mortgage out there. They probably deal with 30 different lenders at least so they can find the lender that’s the best fit for you based on what you’re looking to do with your mortgage. So certainly there are doubling of payments and increasing your payments and lump sums and all that jazz, but it definitely varies lender by lender. If you work with a good broker they can match you up with the lender that makes no sense for you. People always thing it’s all about getting a lowest mortgage rate. While mortgage rates matter, there are definitely other factors like pre-payments, penalties, portability and other stuff that you need to be concerned about. Tom: Great. Is there one more tip or anything you might think of that people could benefit from that maybe we haven’t covered? Sean: Yes, I just touched on it in my last answer. So many people are focused on getting the lowest mortgage rate while they’re shopping for a mortgage. What I like to say is, the lowest mortgage rate can save you hundreds but the wrong mortgage product can cost you thousands. When you’re going to the supermarket to shop for bread you’re not just going to buy the cheapest loaf of bread with the highest level of sugar and not consider stuff like nutritional value and dietary fiber. It’s the same thing with a mortgage. You could certainly shop for the mortgage with a lower rate but it might have stuff in the fine print that doesn’t really benefit you, Yu might get a lower rate but you might not have very flexible pre-payment privileges such as being able to pay down your mortgage quickly if that’s important to you. And, it might have strict mortgage penalties. People don’t consider the mortgage penalties when their breaks their mortgages. So that’s something I just wanted to throw out there. Canadians just love their 5-year fixed rate mortgages. We sign up for them in droves. That’s the most popular option. But something that might surprise you is six out of 10 Canadians actually break their 5-year fixed rate mortgage before the end of the term. If you ask those people upfront when they’re signing up for their mortgage whether they’re going to break it, I bet all 10 of them will say no. But something comes up. They might lose their job or decide to relocate to another part of Canada. Or, unfortunately, they might get separated or worse. There are all sorts of things can lead to that. So it’s important to consider your mortgage penalties and choose a flexible mortgage that’s going to work for years. For example, if you’re an RCMP officer and there’s a good chance you could be relocated, choose the lender that has a flexible portability feature and also has fair mortgage penalties. And if you move to another province then a credit union probably doesn’t make sense because those generally just operate in provinces. Again, by working with a knowledgeable mortgage broker they can help match you with the right lender who will make sense in terms of your own personal financial situation. Just to recap, don’t just shop for mortgages based on rates. There are so many other things to consider. I like to call them the three mortgage P’s; penalties, pre-payments and portability. Make sure you consider those factors because if you can shop for the lowest rate it can come back to bit you later on if you have to break your mortgage. I don’t know about you but I don’t really enjoy spending $20,000 on a mortgage penalty. Unfortunately, I’ve heard far too many stories of people doing that because they just didn’t take time to read the fine print when they signed up and are surprised down the line. So you certainly should take the time to consider all those factors and work with a good mortgage broker. You’ll have a better chance of being matched up with the right mortgage that will benefit you in the long term. Tom: Sounds good. Can you let everyone know where they can find you? Tom: Great, thanks for being on the show, Sean. Sean: My pleasure, Tom. Thank you for having me. Thanks for listening and thanks to Sean for the mortgage advice. You can find show notes for this episode at maplemoney.com/seancooper. Are you a new listener? If so, please be sure to subscribe on the app of your choice. Simply search for Maple Money in iTunes, Google podcasts Spotify and more.